Quiet Branches started off with a broad definition of how plants show up in our lives. Two weeks ago, I wrote about translating research into practical products. And highlighted the many ways biotechnology shows up in our lives every day, in some critical (feeding the world) and fun ways (color changing petunias!). The video from The Howard Hughes Medical Institute I showed domestication of corn likely occurred in the Balsas River valley in Southern Mexico. Today, I’d like to talk about another plant scientist that worked in Mexico and is a big deal in the world of plant biology. 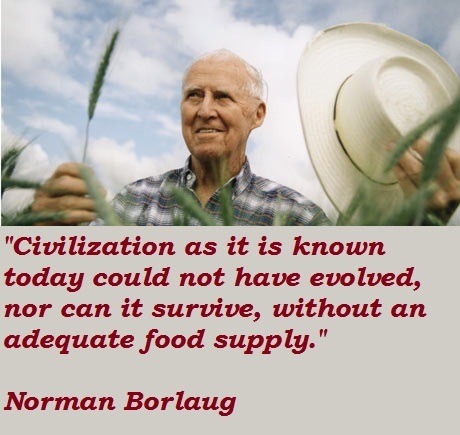 On March 25, it was the birthday of Norman Borlaug (1914-2009). Borlaug is known as the father of the green revolution. 1 billion is a big number. Today’s plant scientists in part motivated by the legacy of Borlaug. There are some new additions to the goals of plant science besides feeding the world. This includes growing more food on less area arable land. Lowering environmental impact of agriculture. Growing more food with less input of resources. And improved diversity of crops. That is both within species diversity and growing more different crop plants. Even if we have enough food to go around right now, that is no guarantee that we will in the future. So far, humanity has defied the predictions of Thomas Malthus in the early 19th century, but that may not always be true. Borlaug’s work in Mexico in the 1940’s, 50’s and 60’s led to them being a net exporter of food. He also exported his varieties of wheat (and later rice) to India and Pakistan, while they were at war. And he continued his efforts to improve food security around the globe. There were advances that made possible the explosion of agricultural productivity. Such as a way to produce ammonia fertilizer via the Haber-Bosch process (this was a huge advance in providing nutrition to plants). Haber has a complex legacy; he was also the inventor of mustard gas. Mechanization occurred as well as simply more advanced knowledge of plant biology. Borlaug bred a series of disease resistant varieties of wheat. He was pretty clever about it, ensuring wheat could resist multiple strains of the wheat rust fungus. Although the wheat crop itself may not have been particularly diverse, there was diversity in resistance genes. So even if some wheat was susceptible, some would resist the pathogens and yield food. His wheat was also semi-dwarf, meaning it was compact and the head of the grain wouldn’t bend or break to hit the ground, causing some loss of yield. One of his clever ideas was to set up two wheat growing test fields several hundred miles apart (the second one located in Northern Mexico). This innovation sped the breeding of the wheat varieties he developed. The more we maintain the natural world, the more of a resource it potentially is for us to use. Protecting and conserving nature is in our self-interest, it helps our resilience. As advanced as it was for the time, plant pathogens could theoretically overcome all the resistance genes present in the population. Indeed, several years ago, the Ug99 strain of wheat rust overcame all known wheat resistant varieties. Scientists did eventually identify a resistance gene from a wild variety of wheat. This is why seed banks are so important as well as maintaining a bio-diverse world. The more we maintain the natural world, the more of a resource it potentially is for us to use. Protecting and conserving nature is in our self-interest, it helps our resilience. And my sense of Norman Borlaug is he would agree with that statement. Plant genetics and biotechnology are like most other human endeavors. We try a lot of things and keep the ones that work. Agriculture is a base technology for humans. Because each farmer feeds multiple people now, it enables some of us to go off to do other things. Build economies, invent new technologies and do all the other things humans do. Of course, Borlaug had the support of many institutions and people that helped him achieve his goals. Including many crop improvement centers, governments and universities. Norman Borlaug helped several nations become more food secure. In the 21st century, that mission is ongoing for a current generation of plant scientists staring down new challenges in feeding the world and protecting the environment. Many of those organizations and even some relatively new ones exist to help plant scientists carry out the mission of keeping the world green and fed. This was an admittedly quick introduction to Borlaug. He’s certainly worth finding out more about, and there is a lot out there about him.